In the lead-up to the Black Alternative Rock Festival, or BLA/ALT, at Camp North End on Oct. 21, Creative Loafing has asked some of the artists to talk about why they're playing the event and what it means to them. Today, Greensboro-based SunQueen Kelcey, the front woman of SunQueen Kelcey and the Soular Flares, tells why she believes Charlotte is the right city for North Carolina's first black alternative music festival. But first, watch Kelcey perform a solo version of her song "Thick Girls Do It Better." Creative Loafing: Why do you think Bla/Alt is so important right here and right now? 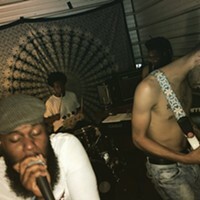 This is the first festival in Charlotte created by a local black alternative musician just for the black arts and music scene. It will show the true variety of talent in the black community, making sure that people know that you cannot put black culture in one box. Black culture spans across many avenues including the social. political, musical, scientific and artistic realms. Why are you and the Soular Flares playing it? We are performing to be a part of such a groundbreaking movement. We are based in Greensboro, but we love the Charlotte music Scene. It's always so welcoming and feels like home to us. Given the recent unfortunate events that have occurred in Charlotte, it is everyone's duty to participate in something that uplifts and empowers the people of marginalized and oppressed communities in any way we can. What are your hopes for the festival? We want it to extinguish and overcome the negative stereotypes of what society deems as "black culture." In turn, this will provide a safe space for anyone to attend the festival for free and for black/POC artists and business owners to showcase their art, and network and sell their products to the public. Hit up SunQueen on Instagram and Twitter (@sunqueenkelcey) and Facebook (SunQueen Kelcey).